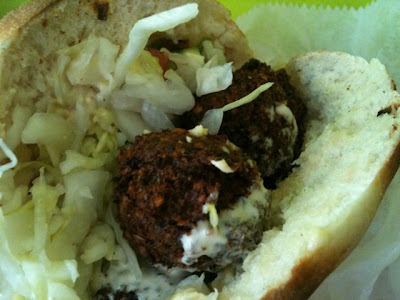 I'm not Mr. Falafel or anything, but when I get one, my favorite is Taim. They make their own bread (you can get white or whole wheat) and they deep fry each order to order. There are three different flavors of falafel:plain, harissa and green. I usually get harissa, but today I was in the mood for plain. Not such a great picture.